After initially signing on in support of the proposal to reduce City Council meetings to two per month, City Councilmember Robert Garcia says he will no longer support it. As he films the scene unfolding in front of him at the Westlake/MacArthur Park station, Metro passenger Brock Bryan calmly pleads with an LAPD officer to stop manhandling a young woman he dragged off the train for putting her foot up on the seat. The officer takes a look at the squirmy teen, the people starting to gather around him to protest his tactics, and calls for backup. The teen is confused and upset, arguing there is no law that says she can’t sit that way. “It’s the rules of the train,” the officer intones. In this, the officer is not wrong – as detailed in Metro’s Code of Conduct, putting one’s feet up constitutes Disorderly Conduct and can get someone removed from a train and cited. But causing a scene by physically dragging a girl off a train and immediately calling for backup means that it is really unlikely that a stern talking to about why Metro considers particular behaviors a problem and a simple citation are on the table anymore. The girl willingly gives her name but says she doesn’t have ID because she was on her way to the DMV to get one, having just turned 18. 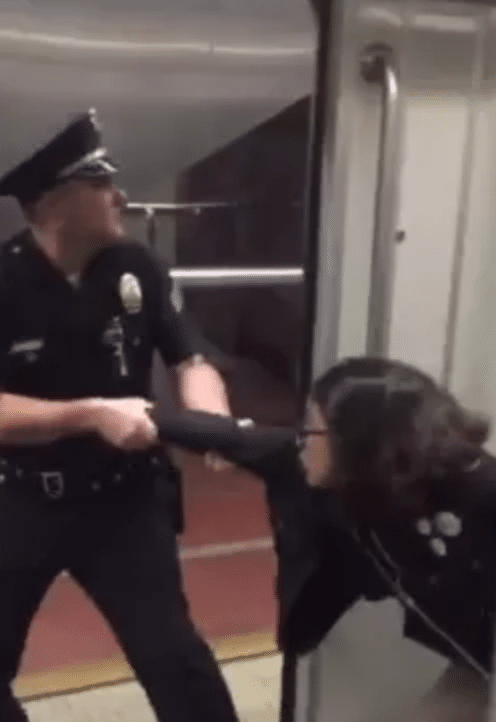 As she gets increasingly upset over the futility of her protests and those of a woman that is angrily engaging the officer in her defense, she offers her backpack and tells the officer he’ll find nothing in there that would justify her being taken to jail. The angry bystander taunts the officer, asking him if he feels good about having yanked a teen off a train, essentially for being disrespectful. “Why wouldn’t I be happy?” he asks. It’s one of the many moments in the video where it is painfully obvious how things will end and exactly why they will end that way. Instead, the moment – like the rest of the encounter – is about the officer trying to exert his authority over the girl and the situation, which means that anything the girl (or a bystander) says or does will be perceived by the officer as noncompliance and disorderly, and even threatening, behavior. In that context, conversation is moot and the only possible resolution is the cuffing of at least one person. As more officers arrive on the scene – a couple of them at high speed – that’s exactly what happens: both the girl and the angry woman are wrangled and cuffed. No explanation is given to the other officers arriving on the scene, no discussion is had about whether this is the proper course of action, no final attempt is made at deescalation. Instead, it all happens almost wordlessly, incensing the already angry bystander, who now lunges and spits at the first officer before being hustled away. The 2017 lawsuit is part of a continued effort to monitor the extent to which Metro is addressing the disproportionate number of citations and arrests of black and brown riders alleged in the federal civil rights complaint the LCSC filed at the end of 2016. But it’s also part of a larger effort to get Metro to spell out who this new emphasis on safety is for, how it is being implemented, and how it is being overseen. In the lead-up to the approval of the new $646 million policing contract between Metro, the Sheriffs, the LAPD, and the Long Beach Police Department, there was no public discussion of how the trains would be policed, of how safety was defined, or of what the expectations or mandates of officers would be. Instead, Metro boardmembers spoke broadly of how greater visibility and saturation on transit would yield improved response times and greater security. Boardmember Ara Najarian went one step further and asked what had to be done to make law enforcement officers feel safer. Citing the video of an off-duty officer in Anaheim wrestling with a youth, flashing his gun and then firing it to scare the kid and his friends, Najarian said. Considering the years LASD and Metro spent clashing over what role law enforcement should play on the trains (Metro wanted the Sheriffs to focus on fare enforcement; LASD preferred to do crime suppression) and the number of complaints that racked up against the Sheriffs, the lack of effort to outline either expectations or mechanisms for oversight regarding engagement with passengers is rather stunning. Neither the lawsuits nor the death of a young man at a train station earlier this year – crushed by a train after he was frisked by LBPD officers over fare evasion and an altercation ensued – appear to have provoked much in the way of reflection on this topic. Perhaps the visibility of this incident will; it’s been viewed over 1.6M times on Facebook. When asked for comment, Metro said that the LAPD had opened a use-of-force investigation looking into the incident. Metro also made clear that it intends for the visible presence of officers throughout the system – a level that has essentially doubled under this new contract – to be what elicits voluntary compliance from with rules from riders. *This post was updated at 8:21 a.m. on January 24 to include Mr. Washington’s statement.